As fall ends and winter begins, chicken keepers need to consider the best ways to look after hens in winter. Here are some tips to help you keep your chickens healthy, happy and laying well during the cold months ahead. 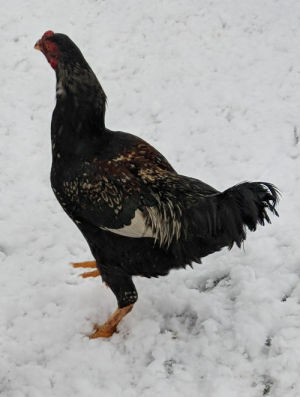 Do bantams and chickens need extra care in winter? Some do. 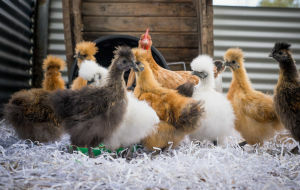 Frizzles, those chickens with large combs and birds bred for warmer climates like the Serama may need extra care in winter if the conditions are below freezing or the weather very bad. Most bantams and ordinary sized chickens do just fine in winter if a few basic rules are followed. 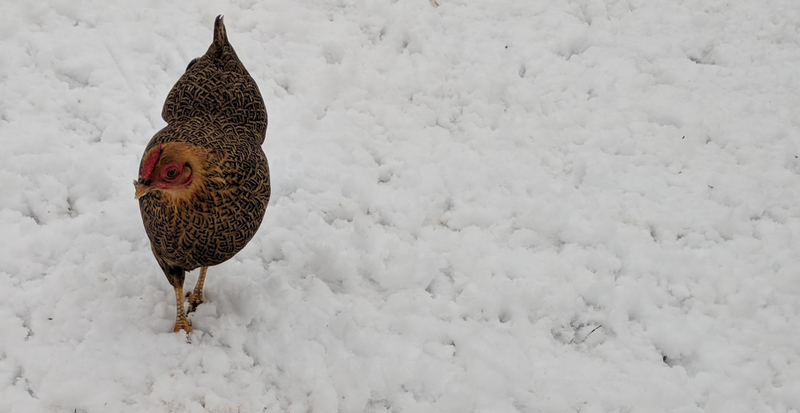 Below: Bantam Wyandottes in the snow. Keep them sheltered, well fed and with access to water and you should not have any problems. This may sound a bit odd, how can a roosting chicken be warmer. Roosting is not just being up high on a perch, it is a state of mind for a chicken, they don't sleep properly if they are not roosting. Roosting is the way chickens’ naturally keep warm when it’s cold. They huddle together on their perches with their feathers fluffed, sharing their body heat with each other. They tuck their heads under a wing and settle down on the perch to cover their feet. For this to happen you need to provide them with the means to do this. Ensure there is plenty of perch space for all the chickens to sit and roost together. If needs be put in a few extra perches or make your current ones longer so more birds can sit together. You can keep the temperature in the coop from plummeting in a number of easy ways. The first way is simply to move the coop into a place sheltered from the winter wind such as next to a hedge, fence or wall. This means that when the freezing winds blow in your coop will be protected from the worst of its effects. 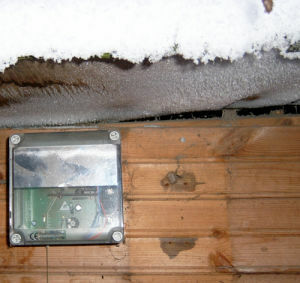 Insulating your coop can also prevent the cold from getting in and heat escaping. There are a variety of materials which can be used for this, but the cheapest and probably most effective is simply to recycle the corrugated cardboard you have hanging around the house. Below: Never block ventilation holes. You can see the moisture freezing as it exits the coop vents. It is very important that this moisture can escape. Use this to build and inner layer by fixing it to the inner walls and roof and remember not to block up the ventilation holes though. Even in winter it’s important that air is allowed to circulate to remove ammonia and decrease the possibility of the hens developing respiratory infections. For the floor of the coop a good thick layer of straw will provide a good barrier to ground frost and keep your hens feet from getting too cold. If you think the temperature will get to a seriously low level, then you can always invest in an infrared Heat Lamp to take the chill out of the air. Finally, make use of the deep litter method, it uses bacterial action to generate heat and can keep a coop quite warm. Although most hens won’t find snow attractive, they will still go out and look for food if they get the opportunity. Don’t prevent this, if it’s too cold for them they’ll soon find their way back inside, and allowing them out when they want will prevent them going cabin crazy and plucking out their own feathers. To make going out a little more comfortable, protect them from frostbite by smearing a little petroleum jelly on their combs and wattles, which are the most vulnerable parts of their bodies. To prevent snow laying on the run area, you can simply cover the top of the pen with a sheet of polythene from the hardware store. Throw some straw on the ground to keep the chickens feet warmer. "Single boards are ample for ordinary English Climate, but are not enough for the far north or for parts of America. More warmth can be got, when necessary in several ways. 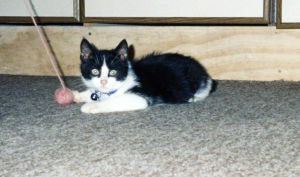 Matting can be tacked inside in winter, but unless removed in warmer months, harbours vermin. Rooﬁng felt is better, the tarry smell repelling insects. But the best plan of all, and Which is also cool in hot weather, is to nail a skin of thinner match-boarding on the inside of the timbers both of walls and roof, leaving an air-space between. This makes a very warm house." If you live in a northerly location you should provide a covered and draught free run with plenty of amusements like hung cabbages and swings or perches. Chickens don’t really need a big change to their feed in winter, but some small adjustments can make all the difference. The main change will be in quantity of feed and layer pellets that the chickens will eat; during winter hens can eat up to 10% more than in summer and this enable them to bulk up, providing an extra internal layer of insulation. The only other change would be to give them a few greens as the ones that naturally occur during summer will have disappeared. A little bit of vitamin tonic now and then will help. In order to keep them laying well, remember to ensure that the percentage of protein in their diet stays at the same level. The main problem with water in winter is that it turns to ice. This obviously prevents your hens getting access to it, especially if you use a drip feeder where the pipes are blocked with ice. 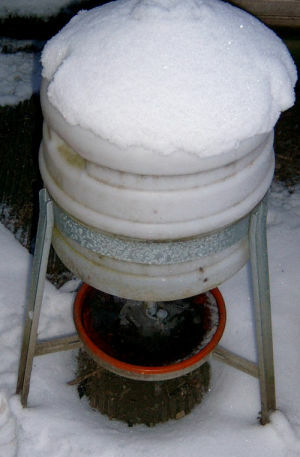 Below: A frozen chicken waterer. Freezing will also split containers costing you money. Does the breed effect the care chickens need during the winter? There are certain breeds of chickens and bantams that are more delicate and could possibly require extra care. You may have noticed if you keep both sizes that the bantams take a while to grow to mature, so you wouldn't necessarily be able to integrate them with the large fowl as soon as if the new chicks were LF. I have Japanese bantams over winter and they seem pretty resilient. Although these birds are much smaller, their combs are much smaller as well so they lose less heat. 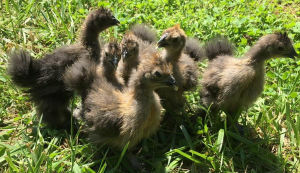 Frizzle chickens need extra care as the feathers do not provide them with the same level of insulation as normal feathers. 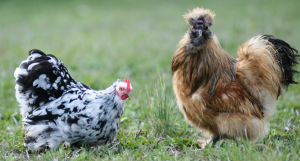 Old English game fowl and Asiatic hard feathered breeds may suffer in the cold. They were bred for warm climates and their feather can be sparse and they have a tendency for long exposed legs. Below: Long legged and hard feathered birds may suffer more in the snow. 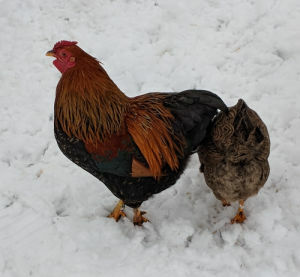 Large combed breeds like the leghorn will get frostbite more easily. Do chickens need heat in the winter? It really depends on where you live. Well fed chickens can survive quite low temperatures during winter even for considerable periods. I keep bantam Barnevelders, amongst others, and last year we had three months of temperature at or below 0C or 32F for more than 3 months with drifting snow and harsh winds and all my chickens were just fine. Unless they're particularly delicate bantams, like a breed that's not cold hardy, large combs or Frizzle types, bantam versions are just smaller types of other breeds, you really treat them pretty much the same as large fowl. Extended frosty periods can cause frostbite of the combs so standard precautions should be taken. I though my Japanese bantams would need extra care but it seems they were quite happy to be out and about with all my other chickens. 1. Chickens must have access to fresh water every day and to resolve the freezing issue you can always use heated base to put under your water. These are inexpensive and do the job perfectly. Alternatively, keep an extra waterer in the house so that when one gets frozen you can swap over whilst it thaws out. 2. Warm feed first thing in the morning, hot mash, boiled wheat or barley will get them up and about. Make sure it's not too hot, around 40C / 100F is fine. 3. Keep them in a secure weather proof house with a fully covered run. 4. In the winter I have a red light bulb in there to extend their day only, not to heat the house. It comes on in the morning to get them up and give them a longer day. 5. I keep drafts out. There is a direct link between the amount of daylight and the number of eggs hens lay. Naturally, hens will lay less in the darkest months. There is a very simple remedy for this, and that is to use lighting in the coop. Ideally chickens need 12 hours or more of light a day for optimum laying. So if it is naturally light for 8 hours, you need to have the coop lit for an additional 4 hours. The lighting doesn’t need to be bright, just sufficient to fool the hens into thinking it’s not night-time. And a red bulb is better, it will keep them more calm. It must always get them up in the morning and never keep them up in the evening. This would leave them on the floor when the light goes out and they will be unable to perch. A low-wattage bulb will suffice but make sure it is located safely in the coop and not shining directly on the chickens – an up lighter is a good idea here. Solar powered shed lights on a timer make a cheap and safe option for most chicken keepers.